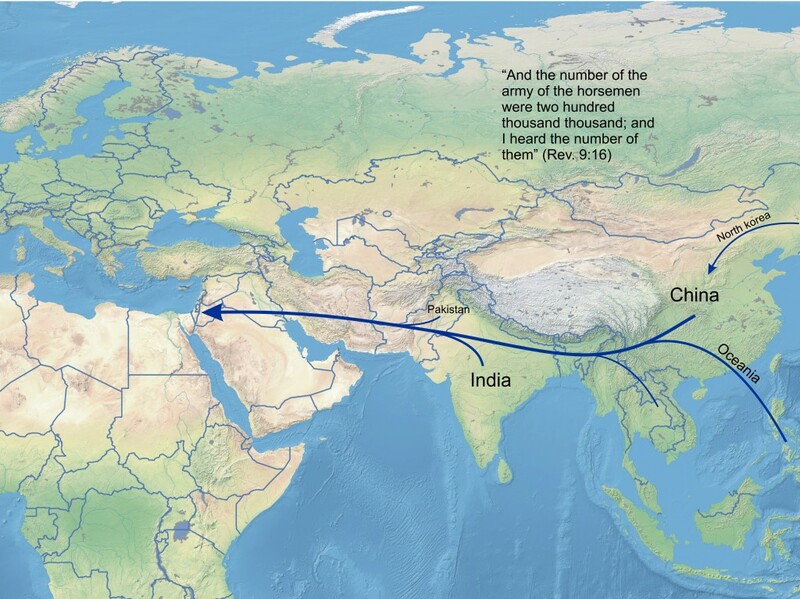 The Bible predicts that the preparations for the attack of China upon the Middle East and Israel involve a combination of human and angelic events. In chapters 9 and 16 of Revelation, there are highly symbolic descriptions of angels affecting the area around the Euphrates River in the last days. It is primarily the reference to this river, which ties the two prophecies together and makes them understandable. If we couple these passages with what the Bible says about the armies moving toward the Middle East from out of the north and east at the time of the end, then the prophecy in Revelation 16 becomes relatively simple to interpret. The events of Revelation 16 are predicted to occur late in the last half of Daniel’s Seventieth Week, near the time of the end of the Great Tribulation, and just before the Kingdom of God arises on the Earth. It is during those final days that the armies of the east will move toward the west and engage in the battles that will already be taking place in the Middle East between the West and Russia. Daniel prophesied of the initial mobilization of these eastern forces as being “tidings” out of the east (Dan. 11:44), but only in the book of Revelation do we find the full picture of what will occur as a result of this attack. The Apostle John says that the great Euphrates River will actually dry up and disappear to provide the eastern armies with a clear path to the Middle East and Israel. It is interesting that in our day the Tigris and Euphrates Rivers are significantly losing water due to massive droughts taking place throughout the Mesopotamian Valley (see Tigris and Euphrates Rivers are Drying Up). This climate change may be a prelude to the Angel completely drying up the Euphrates at the end by pouring out the sixth bowl of wrath upon the river. Thus, after the Antichrist’s armies defeat the Syrian and Egyptian forces as a result of their attacks on Israel and also after the Russian alliance counterattacks through the Middle East and the battles rage, the nations to the Far East of Israel represent the third major front in this war. Is it just a coincidence that in our day a nation has arisen in the Far East, which is determined to become a military superpower along with the Russian bloc and the Western Alliance? The Bible definitely predicts that three large military powers will meet and do battle in and around the small land of Israel. Russia, the Western Alliance, and China are the three major forces which hold the military balance of power today. Despite the breakup of the Soviet bloc nations and the easing of the old Cold War tensions, the majority of all international problems in our generation can still be traced to these three powers or their allies vying for resources, political influence, and territory. When the Empire of the Beast and the Russian alliance fully engage in all-out war in the Middle East—a war that is prophesied to quickly go global and nuclear in scope—the Chinese and the other nations to the east will not remain on the sidelines. We can imagine that with much of the world being involved in World War III and many countries actually being destroyed in a nuclear holocaust, China and her allies will be strongly tempted to join the fray. If they moved in at the right moment, they could end up controlling what is left of the world along with most of its vital resources, especially the oil and gas fields throughout the Middle East. Thus, as the war between the West and Russia rages, and the fires of nuclear destruction begin to rain down on their armies and cities, China and the nations of the Far East will begin to move toward Israel. The Bible says that they will actually be drawn through the release of evil angels at the sounding of the Sixth Trumpet, who will go throughout the Earth inciting violence and war (Rev. 9:13-16). The chaos of the Great Tribulation will swirl every nation up to an intense frenzy of battle, which will cause the mobilization of forces far beyond any army assembled in history. “Saying to the sixth angel who had the trumpet, Loose the four angels who are bound in the great river, Euphrates. “And the four angels were loosed, who were prepared for an hour, and a day, and a month, and a year, to slay the third part of men. At the sounding of the Sixth Trumpet of Revelation, the evil forces that are released will go throughout the Earth to gather all the remaining armies to Israel for the final battle. Note that the timing of this trumpet must be before the Sixth Bowl of Wrath is poured out, which occurs just before the eastern armies reach the Euphrates River (Rev. 16:12). When Daniel predicted that the rumblings from the east would trouble the Antichrist surely the sheer magnitude of the troops that will come against him would make anyone fear. No, the writers of the Bible did not make a mistake when they wrote down this prophecy. The size of the army of the Kings of the East will indeed be 200 million strong! Incredibly, in the day that John penned these words there wasn’t even that many people in the entire world. No wonder the book of Revelation was initially considered a suspect book. For most of history, the fulfillment of a prophecy like this would have been impossible. Most Bible scholars considered the prediction to be more symbolic than literal—perhaps it did describe a large army, but not one of 200 million. However, only in our generation could this prophecy come true. In the same time frame that has seen the rebirth of the nation of Israel, the system of the Beast begin to develop, and Russia (Magog) become a dominate military force to the north of Israel, the world has also witnessed the rise of countries to the east of Israel which could actually field such a huge army. In the summer of 1986 it was estimated that the population of the Earth had reached the 5 billion mark. Of that number more than one-half lived in region from Southern Asia to the Far East. Before the end of the Twentieth Century the world reached a population of over 6 billion people and India and China had populations of well over 1 billion each. Now the world’s population exceeds 7 billion people with China and India combined having slightly over 2.5 billion people (35%). If any countries on the face of the earth could possibly assemble an army of 200 million it would have to come from the countries to the far east of Israel, a region which extends from India to China and down through Oceania. It is also interesting that only in our generation has China tried to come out of its backward shell and progress along with the rest of the world. For centuries they were considered the giant military pushovers of the east. Much smaller nations like Japan and even Great Britain could dominate them simply because of traditionally weak governments and primitive economy and military capabilities. Since the death of Mao, however, things have changed dramatically. China is now concentrating on a course of modernization that could take them into the category of being a superpower, both on an economic and military front. Despite the Tiananmen Square incident, which set back a move toward democracy, China is moving toward a capitalistic society but with a totalitarian government. Under Deng Xiaoping, the goal was to quadruple the country’s economic output by the year 2000 and they succeeded. Since 1990, China’s gross domestic product (GDP) has grown nearly exponentially. By 2010, their GDP was valued to be $5.87 trillion dollars, which made them the second largest economy after the U.S. Today, even with the recent economic downturn due to global recession, China is growing economically faster than any major country in the world. By 2020, they could be the largest economy of any single nation in the world. In addition, China is now buying technology and manufacturing know-how as fast as their economy will allow. They also are building infrastructure such as roads, bridges, electrical distribution, data networks, airports, and major industrial sites at a rate that eclipses any other nation. At the same time, their military capabilities are being transformed from what used to be World War I vintage arms to modern weaponry of the highest caliber. Peter Apps, a political risk correspondent writing for Reuters said, “China’s military budget has grown by double digits almost every year for the past decade and it now fields its own aircraft carrier and is testing Stealth fighters” (May 22, 2013). These developments are happening just in time to fulfill the Biblical prophecies of the last days. The fact is, despite China’s huge population, without making this military transformation their ability to launch a 200 million-man attack on the Middle East would be nearly impossible. However, now with their new economic and military muscle built up over the last 20 years, the fulfillment of this prophecy is now truly possible for the first time in history. We are now seeing all the pieces come into place to prepare for the events of the final seven years of this age before Jesus returns. From the words of Daniel, Ezekiel, and the Apostle John there is a picture being formed of several powerful military alliances attacking Israel at the end. Remember, the Lord said in Zechariah that he will gather all nations to do battle in the Middle East (Zech. 14:2). From the above prophecies, the precise scenario is revealed concerning how these forces will move toward Palestine and engage in final battle. “And I saw three unclean spirits, like frogs, come out of the mouth of the dragon, and out of the mouth of the beast, and out of the mouth of the false prophet. “For they are the spirits of demons, working miracles, that go forth unto the kings of the earth and of the whole world, to gather them to the battle of that great day of God Almighty. “Behold, I come as a thief. Blessed is he that watcheth, and keepeth his garments, lest he walk naked, and they see his shame. Armageddon means “the mountain of Megiddo”. The ancient city of Megiddo existed on the north side of the plain of Jezreel and was always a great military stronghold. This is the same valley that Joel prophesied that God would gather the nations for judgment in the last days (Joel 3:2,12). Here in the book of Revelation, the Lord is saying that this huge valley in Israel will be the place that all the armies of the world will be coerced into marching to by evil spirits. One by one the nations will enter the battle. As the last three and a half years of this age progress, more and more of the world will be enveloped in World War III—a conflict that will far dwarf both previous World Wars in scope and devastation. According to the chronology disclosed in the Bible, when the angels dry up the Euphrates River and the Kings of the East cross it heading west, the final few days before the return of Christ are in view. If we look carefully at these prophesied events leading to Armageddon, then it is clear that the Chinese and their Far East allies (including India and many smaller nations along with them) appear to wait for a time before entering the initial battles. The timing of all of these military moves up until the attack of China can be summarized like this: First Egypt and Syria start the cycle of war after the Abomination of Desolation by attacking Israel (and the Antichrist who just declared himself to be God in the rebuilt Temple). The initial attack will occur exactly 30 days after the Abomination and exactly at the mid-point of Daniel’s Seventieth Week (see previous sections and the chapter on Israel for further explanations). The initial Egyptian and Syrian battles with Israel probably take no more than a few weeks before the Antichrist’s armies begin to intervene—and then only a few more weeks or months for his forces to win. So decisive will his victory be that the Bible says, “…he shall enter into the countries, and shall overflow and pass over” (Dan. 11:40). At this point, the Antichrist becomes aware of Russia and China threatening to intervene. Most likely it will take some time for Russia to fully respond to these events, because of the sheer magnitude of the troops and equipment that will have to be mobilized. Thus, after the Abomination occurs there has to pass at least a number of months and perhaps even up to a full year before the first two superpowers directly engage in battle. Once Russia moves down through the Middle East and decides to attack Israel, however, everything changes. Direct confrontation between Russia and the Western Alliance quickly moves from conventional weapons to nuclear destruction and affects the entire Western world. When China and the Kings of the East also join the battle, nuclear weapons again are seen to decimate what is left of the world. Huge fireballs as a result of nuclear explosions will consume cities and the ensuing firestorms will burn down the countryside of all major nations. The poisons of radiation and contamination which follow these nuclear exchanges will further destroy the ecological balance of all life on Earth. Amazingly, the effects of World War III and nuclear devastation are predicted with incredible clarity within the Bible. The next section will focus on these prophecies, which are some of the most foreboding in the entire Word of God.